BRONX, NY, February 2019 – On Sunday, February 3, Calvary Hospital hosted 120 people at their 39th annual communion mass and breakfast sponsored by the New York Chapter Knights of Columbus. The Chapter presented a check for $10,000 to Timothy P. Barr, Executive Vice President, Calvary Fund. For nearly four decades, the local Knights of Columbus chapter has supported Calvary by making the hospital the principal beneficiary of their year-round fundraising efforts. With this latest gift, the NY chapter has raised more than $1,145,000 million to date for the Hospital’s unparalleled palliative care services. Founded in 1899, the same year that Calvary was founded, the New York Chapter Knights of Columbus consists of 26 neighborhood councils located throughout the Bronx and Manhattan. To make a donation or to support the chapter’s next annual charity dinner on Friday, May 17, contact Joseph Kearns at the New York Chapter Knights of Columbus at (646) 401-4831 or John Sweeney at (718) 344-2776. 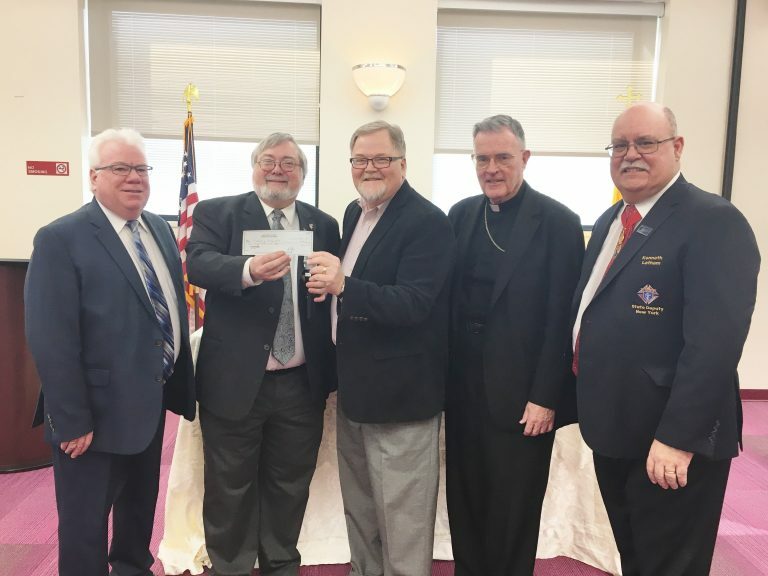 On Sunday, February 3, the New York Chapter of the Knights of Columbus hosted their 39th Annual Communion Mass and Breakfast at Calvary Hospital. Chapter leadership presented a $10,000 gift to Timothy P. Barr, Executive Vice President, Calvary Fund. With this latest gift, the NY Chapter has raised well over $1,145,000 million to date for Calvary Hospital programs and services. Kenneth F. Lathem, Jr., New York State Deputy.